More than half a month has passed since Google released the October security update for its devices. While the Samsung October security patch swiftly follows under usual circumstances, the updates have been delayed this time around. While the flagship devices such as the Galaxy S7 and S7 Edge would usually receive the security bump first, this time, the mid-rangers are the first in line. The Galaxy A8, Galaxy J7 Prime, and the Galaxy Core Prime are surprisingly the first devices to receive the Samsung October security patch. You can find the build.prop files of all the three devices below, which highlight the security level is now updated to October 1. The updates seem to be incremental and if you haven’t received it on your Galaxy A8, J7 Prime, or Core Prime already, expect it in the upcoming days. So expect the OTA notification for the Samsung October security patch to pop up on your device any day now. You can also manually check for the updates by heading over to Settings->About phone->Software update->Check for updates. However, if you are among the unfortunate who haven’t received the latest updates despite the same being released in other regions, there is a way around it. 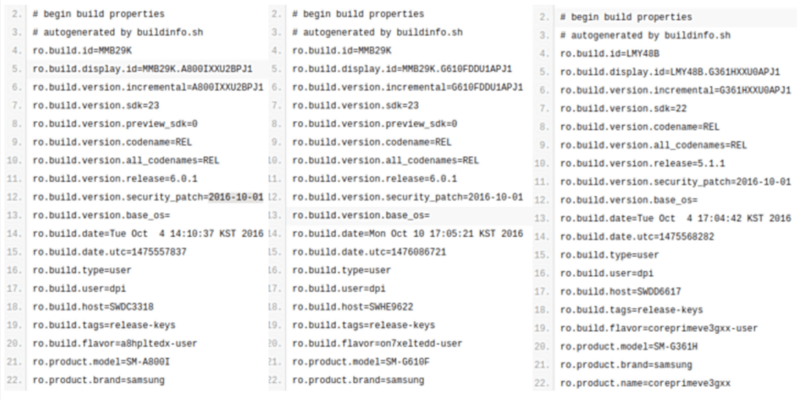 Head over to the Updato Samsung firmware platform and have a look at other Samsung updates batch.